That Organic Raw Ground Vanilla was very expensive. Like $54. I had plopped it into the basket when my husband wasn't looking. 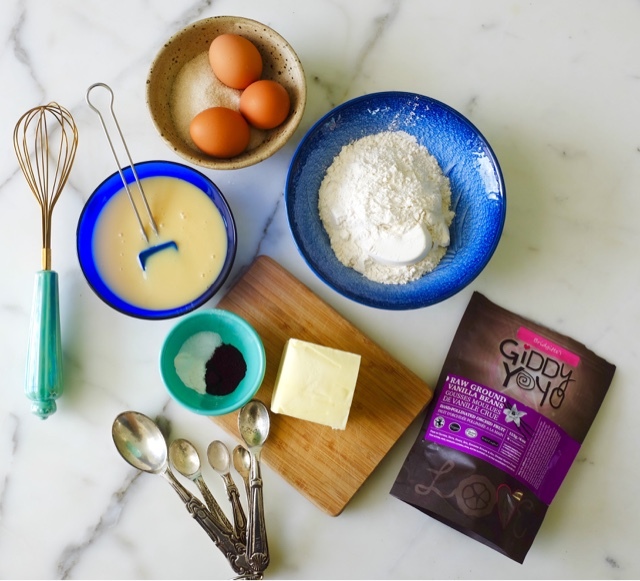 I'm baking cake (non-gluten-free!) for my kid today. It's been forever since she asked me to bake anything. She's not a sweet-tooth like the 9 yr old. So this morning when she arose from bed and exclaimed "mommy, you can bake a cake if you want. My friends are coming over after school" I was like "holy smokes!" Since when did "after-school playdates" evolve into "hanging with friends?" When I started this blog, it was primarily to document recipes for my newborn (the big kid in question...Bebe is her alias on my blog). I was hoping to leave a legacy of recipes and stories for her but the blog took on a life of its own as I explored cake decorating and photography and found myself engrossed in trying to make my blog more beautiful. So Bebe is heading to high school in September. Along the way, I've put the blog on the back-burner as real life (and actual money-paying) opportunities took precedent. The blog was never meant to earn me any money and I had initially balked at ugly ads...but I gave in. Cake supplies were expensive! The blog is still a money-loser on the whole, but it is priceless in connecting me with wonderful bakers and bloggers around the world and I have even met some of them in person! Currently, I just feel more connected to people on Instagram than I do on this blog because there is a sort of immediacy and intimacy that Instagram has that blogs don't. I like being connected to my readers but I've lost a lot of readers because I allowed the frequency of my posts to slide. This is a choice I made because I had to take time for my health, my life, my kids and career. I don't regret it. Thank you if you're still following my blog and reading for over a decade! Thus, this morning...upon entering the kitchen I immediately took out some good butter to soften for later. This chunk is unsalted local Avalon organic butter. Then I spent a good couple of hours contemplating what type of cake I would bake. I took a nice morning run--and then after coming home and opening my pantry I spied the ridiculously expensive bag of GiddyYoYo Ground Raw Organic Vanilla I had recently bought at Famous Foods. Batter ready for the oven. The ground vanilla looks amazing! 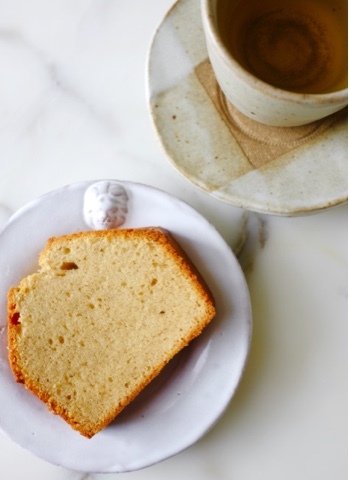 I felt no guilt baking this pound cake because I knew I wasn't going to eat it. In fact, with 7 girls in the house after school, they made short work of eating almost the entire loaf in under an hour. I have been pretty good with avoiding eating too much gluten and my Hashimoto's disease is quite manageable now. With regular exercise and a personal trainer to help me resolve my shoulder impingement I'm finding myself feeling way better. I've been busying myself on Instagram with my newfound love of Smoothie Bowls and Chia Pudding. I'll be posting something on smoothie bowls soon. I have accumulated quite an arsenal of toppings for these healthy post workout smoothies. An afternoon snack baked for my kid's friends on a Friday Afternoon. Have a slice with a glass of milk or a cup of green tea. 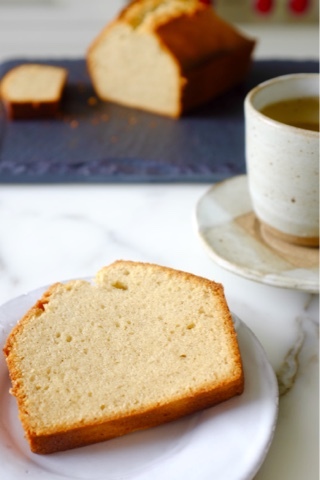 This Condensed Milk Pound Cake is a delicious start to the weekend! 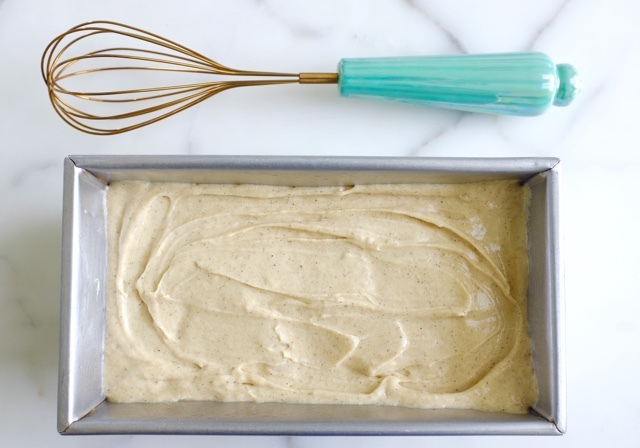 Generously butter and line with parchment an 8 1/2 x 4 1/2 - inch loaf pan and set aside. Put the sugar and the ground vanilla in the bowl of a food processor fitted with the metal blade and pulse. Transfer the batter to the prepared loaf pan. Bake at 350 degrees F for 45 minutes; then reduce temperature to 325 degrees F and continue baking for another 35 minutes, until the top is dark golden brown and a tester inserted in the center comes out clean, about 1 hour 20 minutes total. Cool completely in the loaf pan on a rack, then unmold.